Over one weekend, Sydney Open will unlock the doors of more than 60 of the city’s most important, inspiring and intriguing buildings and spaces. On 3 and 4 November, Sydney Open invites you to explore some of the city’s most treasured and architecturally significant buildings. On Saturday 3 November, go behind the scenes at some of Sydney’s most in-demand and intriguing spaces, from harbourside heritage to stunning architecturally designed private residences, on our expert-led Focus Tours. On Sunday 4 November, enjoy the freedom to plan your own architectural adventure from our open-access program of 40+ buildings across Sydney’s CBD. Located in Circular Quay at the gateway to Sydney’s CBD, 33 Alfred Street has been a prominent feature on the Sydney skyline for more than 50 years and remains the home and headquarters of AMP (the Australian Mutual Provident Society) to this day. Opened in 1962, the AMP ‘Sydney Cove’ Building, designed by Peddle Thorp & Walker (now PTW Architects), was Sydney’s first to break the city’s 150-foot (46-metre) height limit, imposed from 1912. At 117 metres, it was Australia’s tallest building, almost double the height of anything else in Sydney at the time. It is also considered of state heritage significance. But the building courted controversy for more than just its scale; its postwar International style was unlike anything Sydney had seen before. The twin crescent towers soared 26 storeys, linked centrally into an H-shape and set free from their podium. They symbolised an emergent new culture, that was dispensing with traditional ties. An observation deck on the top floor was open to the public, offering Sydneysiders and visitors views of the city and harbour from a never-before-seen angle. Aluminium and glass curtain walling was used to capture magnificent harbour and district views. It was also one of the first buildings to use seawater air conditioning, requiring an onsite ‘frogman’ to maintain its water-intake pump house. Part of this new building language was the use of public art. A Tom Bass sculpture on the western facade depicts the Goddess of Plenty watching over a family, to invoke AMP’s founding principle: ‘Amicus certus in re incerta’ (a true friend in uncertain times). Behind this Sydney Cove treasure, AMP Capital will be transforming the precinct where 50 Bridge Street currently stands. The new Quay Quarter Tower, designed by Danish architects 3XN, represents the first major project in Sydney designed by a Danish architect since Jørn Utzon designed the Sydney Opera House in the 1950s. 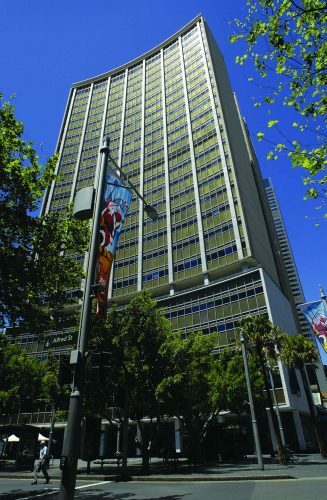 A Development Application (DA) has been submitted to revitalise the AMP Building, with the sensitive renewal of the building’s facades, reinstatement of lost building features, refurbishing internal spaces and significant improvement to the environmental performance of the building to bring it in line with premium commercial office standards. It follows two years of consultation and will restore the building to its rightful status as a premium-grade office tower in keeping with its history, and its prominent place at Circular Quay. During Sydney Open, Settlement on Quay cafe, on the ground floor of 33 Alfred Street, will be operating from 9.30am to 2.30pm.